There’s a new comedian in town and he is fast gaining popularity. I’d dare say that he is Kenya’s next biggest jokestar. Move over Churchill! His real name is David Oyando. As a comic, he goes by the moniker Kendrick Mulamwa or just Mulamwa if you like. Interestingly, he got this name doing a remix of Kendrick Lamar’s song. Mulamwa has been doing comedy since 2012. He recorded a short clip in January this year and shared it on his Instagram page. Hours later, it had garnered thousands of views. This motivated him to keep making videos an sharing them on his social media pages. Within no time, the up and coming comic had gained a legion of loyal fans. He has kept his fans entertained in the last few months. Comedy bigwigs like Eric Omondi, Chipukeezy and DJ Shiti all agree that he is talented. By the look of things, it’s only a matter of time before he becomes a regular face on you TVs. Watch out Mulamwa! 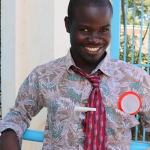 The post Mulamwa is Kenya’s next biggest comedian (Video) appeared first on Ghafla! Kenya.